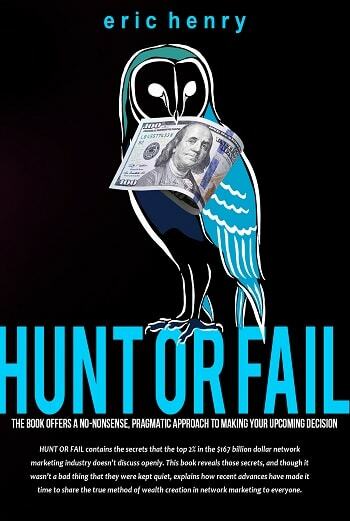 Today we are interviewing Eric Henry, author of the network marketing/business book "Hunt or Fail." I’m an investor. My field is commercial real estate. Prior to this I worked in distribution and import/export splitting my time across Washington, D.C., Miami, FL and Africa. I am extremely driven, but it’s not out of greed… it’s because I’ve seen what can happen when people don’t think money is important. We really wanted to jump into the debate about network marketing. There is a huge section of business people who make fun of beginner network marketers and call them spammers or scammers… but then on the top you have hedge fund managers investing billions into these companies and even fighting over the ethical issues and shorting the companies… it’s quite a spectacle. So we really wanted to add our insight into it having been pitched by a top performer in the industry. What was exposed was a key that anyone can use in order to get wealth. This is a secret to success and happiness. If you follow the advice in this book you will have no choice but to grow and begin to become a hunter. You’ll see the world differently after following the advice in this book. That’s an interesting question. On one end there are the people who are actively practicing what we say to do in this book… these people have mansions, supercars, time freedom, awesome relationships... and then you have a larger group who want to be wealthy but are paralyzed by fear or lack of training, but will still join the network marketing companies. Unfortunately a lot of them are fed magical-thinking books that keep them in a state of consumption of the products, but keep them from producing. We give the solution to this in the book. We wanted to reveal what no one’s talking about. What inspired you to write a book about network marketing? We were at a nightclub in Miami where people go to show off their wealth… typically someone will purchase tables in bulk and then flip them to other wealthy people. A $10k table will even be bid up to $30k sometimes depending on the event. There’s this big secondary market for this… their game is all about proving their worth by showing how much money they can spend. The network marketing team we met were making so much money that they were free to do this and meet other people succeeding as well. We were in a company with members from South America who lived by this code… completely spoiled, hundreds of thousands at their disposal (and multi-millions at their parents disposal), little attachment to reality… and no successes under their belt. We tried bridging the gap between their fantasies and the real opportunity we saw right in front of us, which was one of the most challenging tasks we’ve ever taken on and in hindsight, too charitable. Their parents kept them at a distance so they’d figure it out on their own which was understandable, but it turned out to be a big mistake because they ran from the best opportunities and ran towards the terrible ones. To make a long story short, people would approach us all the time with business opportunities. One the most prominent occurred at the nightclub when the network marketer started talking to us. Turned out he was a leader in one of the biggest MLM companies. By the way… we left the name of the MLM company out on purpose, because we didn’t want to have a bias. The approach we detail in the book can be used by any network marketing company and many businesses, in fact. The network marketer wanted to expand to South America and needed our help to do it. We met him later on and he explained to us the real business model… how the top really view their sign-ups. He covered the mindset and the skills needed to succeed. It was jaw-dropping. Tell us a bit about your experience working with a network marketer you met at a club in Miami. They were professional and their confidence was inspiring. They gave us a presentation at this mega office in Coconut Grove… right on top of a supercar dealership. They already did their homework on the culture they wanted to market towards and knew it was very hierarchical. They also knew the average person was typically uneducated. If the “high society” people did something... they expected a huge percentage to jump in. What they offered was for us to sign up beneath them and funnel all the expansion directly under us… so in essence, for little work we’d be guaranteed to be at the top of the pyramid. They did, however, need our boss's collaboration and presence in the marketing. Our boss was very interested initially but then backed out completely once he realized he had to do work. Every few months we'd get contacted by the network marketer asking us if our boss was still ignoring talking about it… it was hard telling him he was more interested in video games than work and was rotting in his room with coca cola bottles everywhere. What was your understanding of network marketing like prior to meeting this network marketer and his inner circle? We had done one in high school for a few months and it really helped our conversational skills, cold-calling, approach anxiety, management skills, humility, confidence and salesmanship but we were too young to really get what it was offering and too afraid to put ourselves out there. It is scary. You’re getting so much rejection and losing most of your friends in the process. I mean, that’s the case no matter what success you have… it’s like crabs in a barrel… the fisherman don’t need lids because when one tries to escape the other crabs grab their legs. It’s not even personal… it’s just most people don’t want to have your success show their failure. Ever wonder why so many lottery winners wish it never happened to them? They weren’t forced to grow as a person in order to handle that power, as people do who create their own wealth. What do you think are some of the biggest misconceptions people have about the network marketing industry? I’d say first is that it’s a pyramid scheme. It’s completely legal. Also working 40 hours a week selling your time at wholesale to an employer is somehow better and somehow less of a scam? How is a corporate ladder not a pyramid scheme? You’ve got the board, a CEO, top management, middle management, supervisors and employees. You could write a book on this topic itself on how corporations exploit people’s time and money. They are the actual pyramid schemes. And the courts ruled what they did regarding network marketing… it’s legal. For many, however, they will be more comfortable working jobs and leaving the harder psychological work to their higher ups. Our book is for the people who know corporations are a scam, don’t care about the inevitable shakeup to the power structures of their friends and family, and want to be their own boss already with little to no risk involved. The risk in network marketing is from not knowing the mindset in our book… it’s that black or white. Our hope is that it is going to help people and make them stronger. The business world is brutal and unforgiving… you have to be tough. We worked hard to create a step-by-step approach that can be modified in unison with a network marketing team leader and yourself so that the process is duplicatable. Our intention here is to help create giant downlines for network marketers. This book will do that. We are working on a few self-help guides and motivational books. Our prized book in development shows all the things one should NOT do in a business start-up, using many examples from numerous companies we have been in. Sometimes studying what not to do is just as valuable as studying what you should do. We see a clear lack of these books in the marketplace right now. We have multiple contributors on this project so it will be about a year until that one is finished. If you really want success in network marketing… this book is the key. Once you read the book you'll see there's really no other choice.